On Saturday July 13th 2013 Menno de Jong is returning to the sun-spot of The Netherlands for an 8 hour marathon Trance and Progressive experience. Two years ago Fuel Beachclub in Bloemendaal aan Zee hosted his previous extended solo set, which was received with great enthusiasm by clubbers of all nationalities. With new singles, remixes and inspiration under his belt the tallest professional DJ in the world embarks on another musical voyage through the genre he has supported for over a decade. After igniting the Trance scene with nu-classics such as Guanxi, Tundra, Spirit, Last Light Tonight and remixes for gems such as Karen Overton – Your Loving Arms and Mark Otten – So Serene. Menno de Jong has been flying the flag for the European Trance sound to all corners of the globe. Having graced some of the most popular venues of The Netherlands such as Studio 80, Westerunie and Fuel Beachclub, this bi-annual event is always eagerly anticipated by his global following. The last edition under the sunset of Bloemendaal aan Zee featured the premiere of his signature ‘old-school for the new-school’ Trance productions such as Turtle Paradise, Place In The Sun featuring the beautiful vocals of Ellie Lawson, and Stardust. Since then his studio efforts have resulted in beautiful pieces such as the piano-infused Never Lose The Magic, and a collaboration with California based Trance pioneer Kristina Sky: Signals. 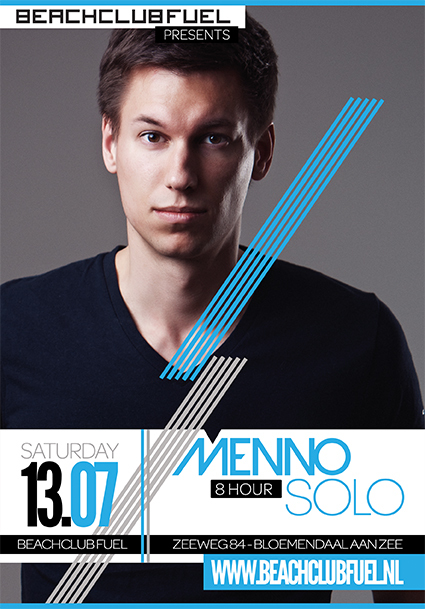 Saturday July 13th will be a showcase of both the old and new that has brought Menno to where he is today. Expect some of his latest unreleased works, powered by beautiful visuals, with the mesmerizing sunset over the ocean as a backdrop. In honor of Menno’s solo appearance at Fuel Beachclub he was asked to mix the official Fuel 2013 album for this summer. The CD features 17 carefully selected tracks and is scheduled for full release May 20th on Black Hole Recordings. To get your mind geared towards the forthcoming festivities don’t forget to tune in to the monthly Menno de Jong Cloudcast, which is now listened to by thousands on internationally popular Digitally Imported radio, Soundcloud, Mixcloud and the iTunes podcast directory. Early birds can purchase pre-sale tickets for this one-time experience for 10 euros by surfing to www.beachclubfuel.nl.